Woodworking is a tedious and time consuming task that is attempted by many, but mastered by very few. Many beginners who are trying to get started in woodworking often worry about their budget and try to figure out how they are going to get started. Great news, you do not have to spend a fortune to get started! Do I have adequate power supply? Do I currently run cordless tools now? Corded tools provide constant power and you do not have to worry about them dying mid-project. On the flip side you are also limited due to the cord. Cordless tools can do anywhere! With today’s cordless battery technology you will not be “robbed” of power. Battery packs range from 12v-60v and from 2.0 Ah to 12.0 Ah. 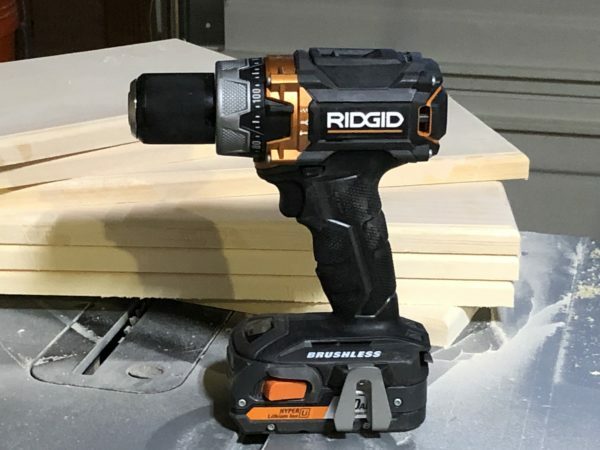 Many cordless power tools offer brushless motors which give the tools better longevity and better performance. As a remodeling contractor my jobsites are basically cordless, with the exception of just a few tools. Having a cordless tool battery platform, made my decision simple. It wasn’t until this year that I started getting into woodwork, when my wife decided to start her own custom wood craft business. Since then I have really taken a liking the stress free time in my shop! There are 7 major woodworking tools that beginning woodworkers should have to start. These seven tools will not break the bank and will get you to a level where you can tackle a many number of projects! Some might think that a circular saw is just a carpentry tool and not for woodworking, we disagree. The circular saw could be the most all around functional basic power tool. Clamp on a straight edge and you can cut sheet goods just as accurate as a table saw. A good quality circular saw should be one of your first purchased power tools! The dill is versatile in many ways and useful for drilling holes or fastening hardware. Drills come with either a 3/8” or ½” keyed or keyless chucks. We recommend ½” chuck for larger drill bits, spade bits, hole saws or forstner bits. You will find yourself using these tool quite a bit so, find one that fits your hand well. The jigsaw is a must have for a beginning woodworker, it gives you the ability to cut curved or circular patterns out of stock. For thicker stock cuts a band saw would be preferred, but for beginners, a jig saw is great choice and start. When choosing a jigsaw, consider an orbital action that ergonomically fits your hand. Also make sure you are comfortable with the blade changing system. 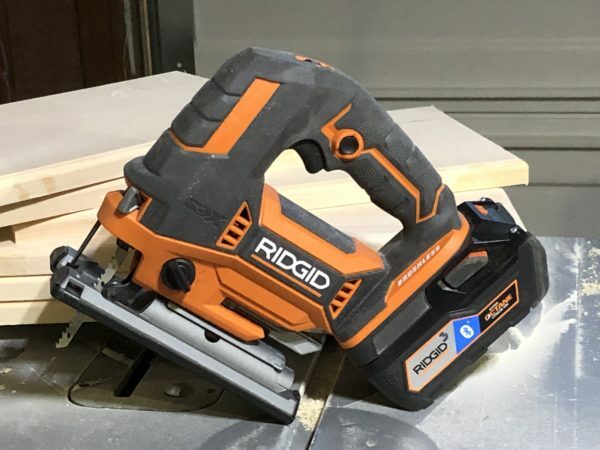 The next important handheld power tool would be the random orbital sander. 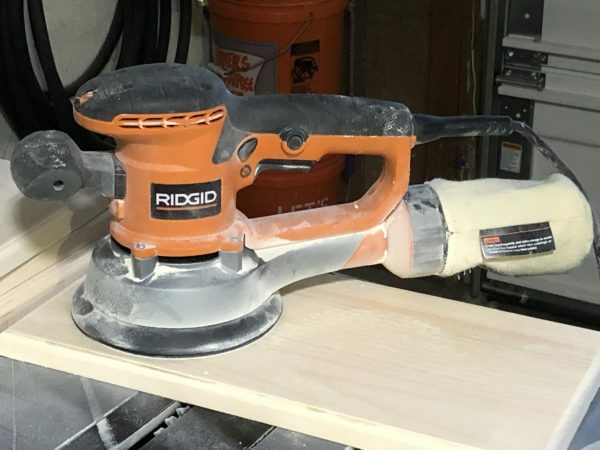 The random orbital sander does not sand in patterns, it has a random sanding motion that will reduce the chance of leaving sanding marks on your wood. Box stores will also carry a vast variety of discs in many number of grits. Start off with low number grit and continue higher to achieve a smoother finish! Once you’ve become proficient with the first 4 tools we have listed, now its time to make an important purchase, the table saw. The center-point of every woodworker’s shop is the table saw! Its like the kitchen table, everything revolves around it. There are no doubt several, maybe even a dozen make and model table saws out there. 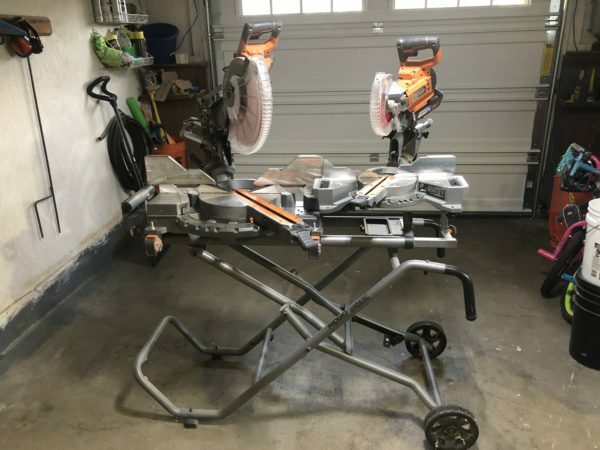 You want to buy the best, most affordable table saw for your budget, and one that will fit in your shop. Take the time to learn which features you really want and the table saw that best fits your budget and your needs. 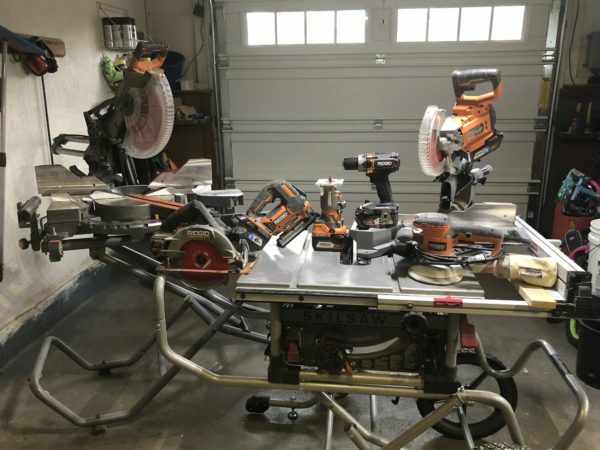 Stationary table saws are great for larger, more open spaces, while portable job-site table saws are perfect to move around and store in small shop areas. The last major purchase you could consider is the miter saw. A compound miter saw is extremely valuable for cutting angles and bevels. Once you mastered your skills and ability to make precise cuts with a compound miter saw you won’t be using your circular saw as much! 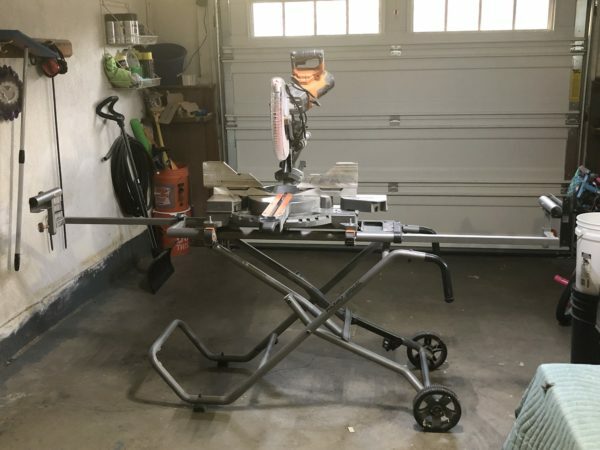 Seen in this picture is my corded 12″ dual bevel sliding miter saw as well as my 7-1/4″ cordless dual bevel sliding miter saw. There are benefits to having either one. 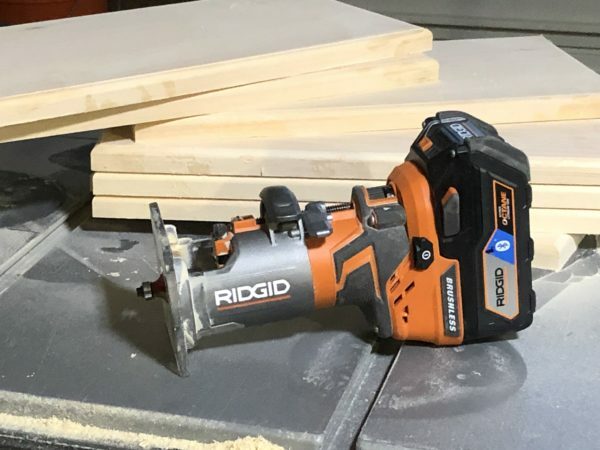 The 7-1/4″ cordless miter saw will cut up to 8″ stock at a 90° but the corded 12″ miter will cut up to 16″ at a 90°. Longer boards or repetitive cuts are easier to handle on the corded miter saw because of the mobile stand it has. The final tool recommended for every beginning woodworker is a router. There are two base style routers available, stationary base and plunge base. For most beginners, a stationary base model will take care of a number of projects, and you could eventually mount the router to a table should you choose to invest in (or maybe even build one) one down the road. If we had to pick just one extra tool to add it would have to be a good vacuum. There are several different types of vacuums on the market that have variety of prices. 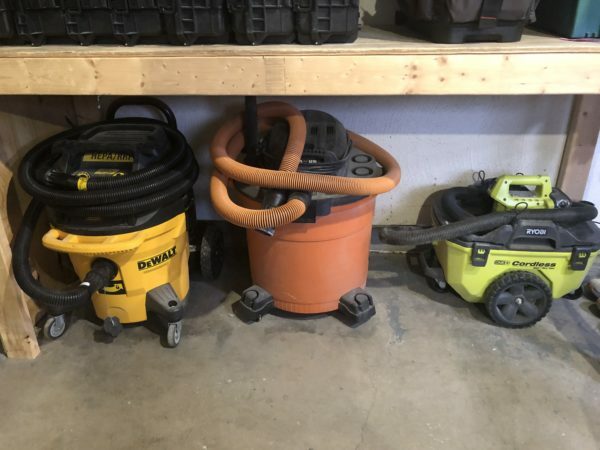 From dust extractors to wet/dry vacuums to even cordless vacuums. You are going to want one with the right attachments to avoid wasting your time sweeping up all the man glitter! So now that we have been given you our recommendations, you should be asking yourself “what is this going to cost me?” Well as of the time this article is written, here is the cost of the items pictured in this article. Side note to consider, some of these tools in this article are larger, more powerful than a beginner might need. 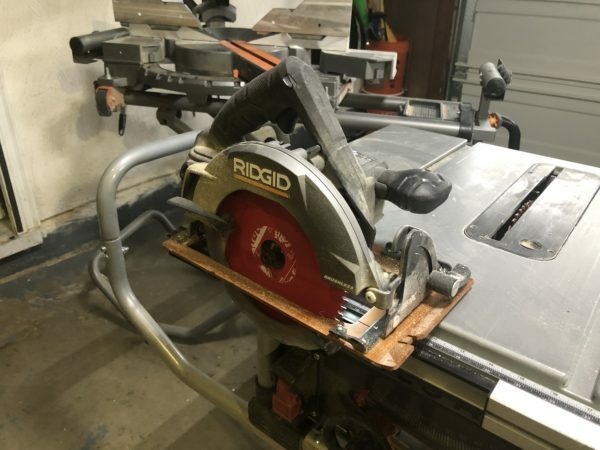 An example would be the Miter Saw featured in this article was purchased for other uses besides woodworking. A beginner my opt for a smaller 10″ which would reduce the overall cost. 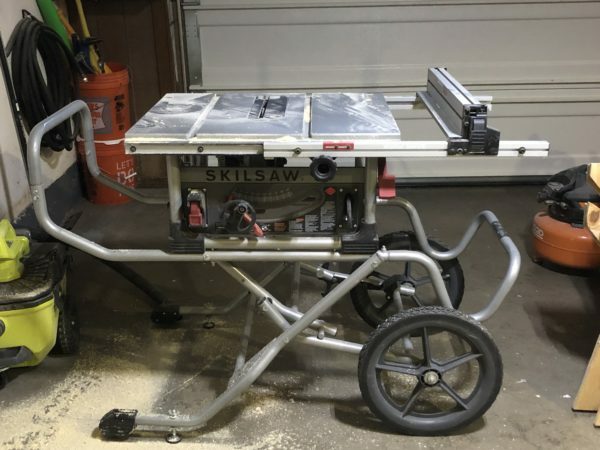 Another example would be the Skilsaw Table saw. This is a professional grade table saw which raises the cost significantly.